There is something about cats that everyone loves. Purring! When your cat comes to your lap, rubs softly against you with its head and starts purring, you know that everything is all right. Not only can you hear purring, you can also feel its vibration sometimes. How and why do cats purr? Some people claim that nobody has yet discovered how cats purr, so debates on this subject are still taking place. Some scientists say purring is a reflex rather than a voluntary act. 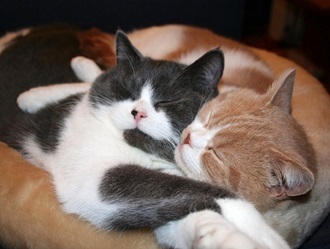 Originating in the central nervous system, purring is a result of rapid and rhythmic pressure changes in the windpipe. The latter is caused by the stimulation of muscles in the larynx. Air passes through the opening and closing valve, and it creates the well-known purring sound. The muscles work during both inhalation and exhalation; this gives the impression that a cat purrs continuously. In most cases, cats purr when they are content or pleased. Nonetheless, cats often purr when they are stressed, for example during a veterinarian visit or when they are recovering from injury. Thus, purring is not only an expression of satisfaction but also of pain. In other words, cats purr in stressful moments in their life. Purring is also a way for kittens and their mother to communicate. Kittens learn to purr much earlier than they learn to meow. The mother cat often purrs at her kitten too. The frequency of the purring sound is between 25 and 150 Hertz. Some researches have proved that sound frequencies of this range can help improve bone density and promote healing. It is possible that purring is a natural low-energy healing mechanism. Perhaps, the myth about cats having "nine lives" has something to do with purring? Perhaps, the ability to purr explains the fact cats do not have so many muscle and bone abnormalities as dogs? It's just a guess, but purring might help prevent dysplasia and osteoporotic, which are so common in dogs. Even though it is so tempting to claim cats purr when they are happy, they may actually be purring to communicate and self-heal. Or heal the owner... Who knows?